Your wedding bands are a symbol of your union and a constant reminder of your love so why not make them extra special and create something meaningful together which really signifies this for both of you. 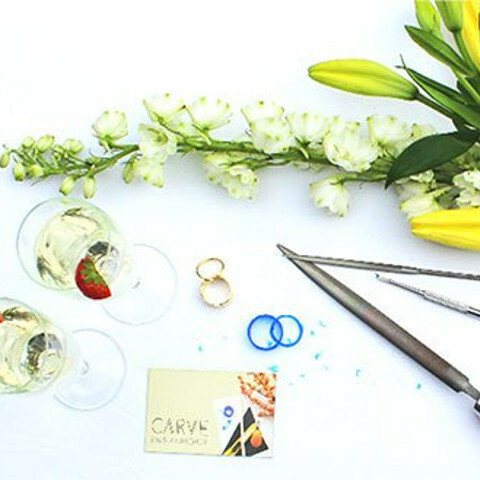 Carve is now offering private workshops where you can carve your wedding bands together over a glass of bubbles followed by a meal in the boldly designed and beautiful setting of Tribeton, Galway. Grace will guide you both through your design options and help the bride to be with getting the perfect carving to fit snugly to her engagement ring. Once you are happy with your creation we will weigh the wax ring and give you a quote on a range of precious metals including 9/14/18 carat yellow, white, rose gold and platinum. The rings are then professionally hand finished with love and returned to you sparkly new and ready for your special day. My joy this week when I saw the finished product of our evening was unbelievable....... my new ring is exactly the same as a ring I had lost....only better, as it is new and the end result of a combined effort of my three daughters and I to 'get it right'. Thank you so much for a fantastic experience. I will treasure my ring forever and it will be a talking point due to its history. The three of us had a wonderful family evening, the memory of which is very precious particularly for me as a very grateful Mum. Thank you so much for an absolutely brilliant evening! My girlfriend was so delighted with the surprise but to be honest I was more surprised at how much I enjoyed it myself. The whole process was so enjoyable and the finished ring was beyond what I had expected to make. The Mother’s birthday’s next, I’ll be Mr. Popularity.